Rendering of the telescope in which the primary, secondary and tertiary mirrors are shown. 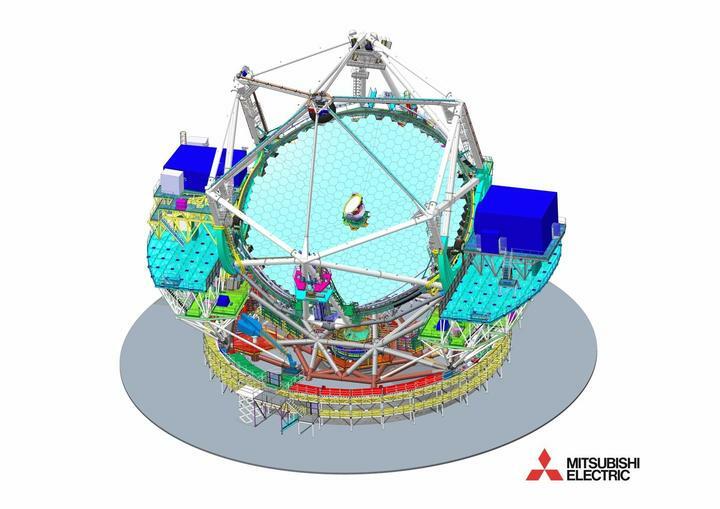 The first light Adaptive Optics (AO) architecture for the TMT has been defined to provide near-diffraction-limited wavefront quality and high sky coverage in the near infra-red (IR) for the first TMT science instruments IRIS and IRMS. NFIRAOS is an order 60 x 60 laser guide star (LGS) multi-conjugate AO (MCAO) system, which provides uniform, diffraction-limited performance in the J, H, and K bands over 34 x 34 arc sec fields with 50 per cent sky coverage at the galactic pole, as required to support the TMT science cases. The role of the telescope structure is to carry the telescope optics and instruments, the telescope utilites, laser guide star system and other subsystems. The telescope structure consists of all moving parts of the telescope except the science instruments and telescope optics. This include the azimuth journal, azimuth platforms, elevation structure and telescope drives.